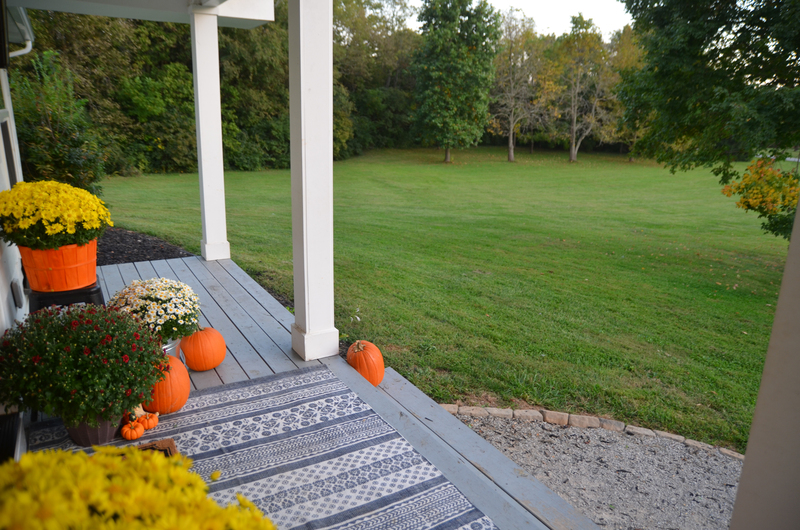 Welcome to my Fall Farmhouse Front Porch! 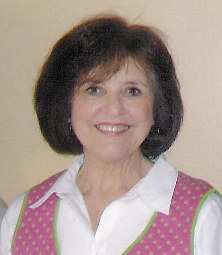 I am so thrilled to have you here! You may be a regular Beneath My Heart reader, or this may be your first time visiting my Kentucky home….either way, Welcome, Y’all! I’m honored to be a part of the Seasons of Home series hosted by the sweet Ella Claire Inspired! 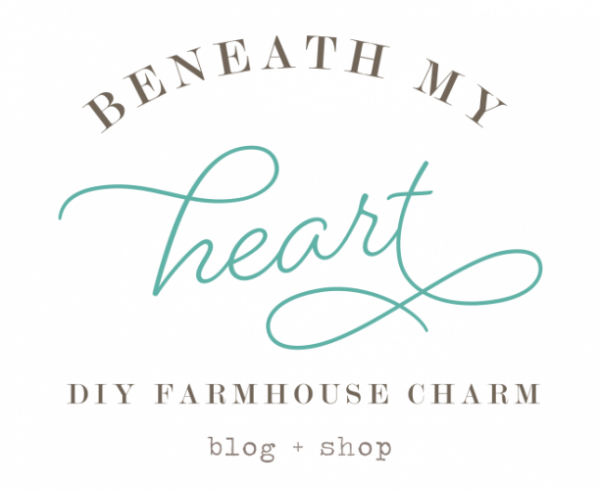 I love checking out all of the beautiful homes of the other bloggers participating. Fall is my absolute favorite season. This time of year in Kentucky is absolutely amazing! 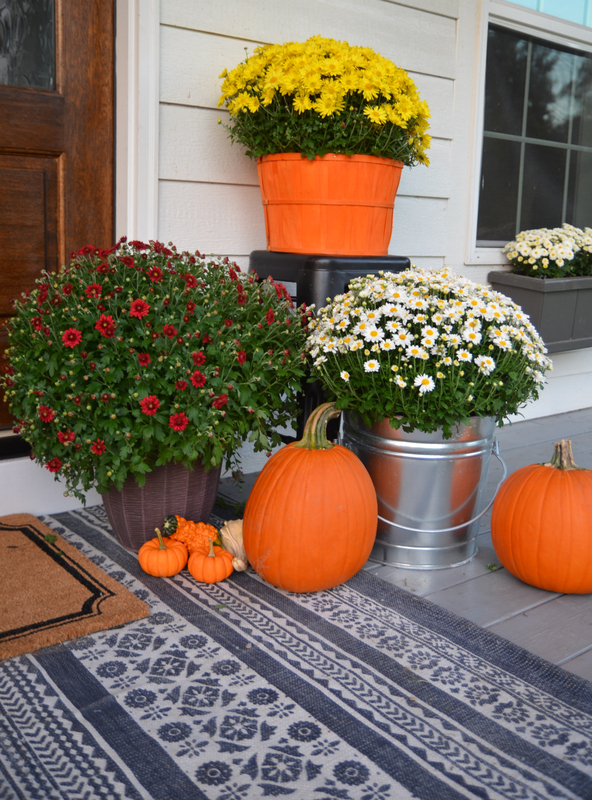 My children love it too, and they were thrilled when they saw me adding mums and pumpkins to our front porch! As you can tell, I am a traditional kind of gal. 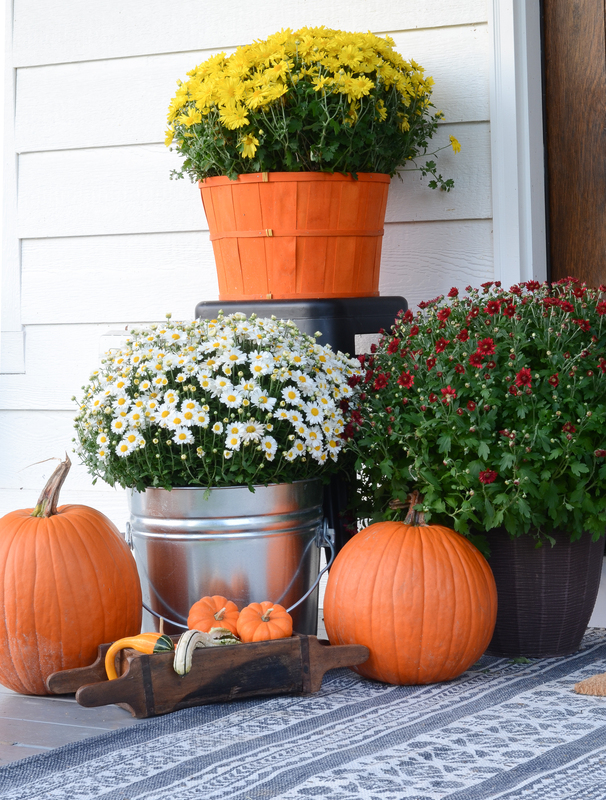 I love adding the bright colors of fall to my front porch, like orange and yellow. Yellow mums are my favorite. What’s yours? I found the blue rug at Hobby Lobby and knew I would want to use it on my front porch. 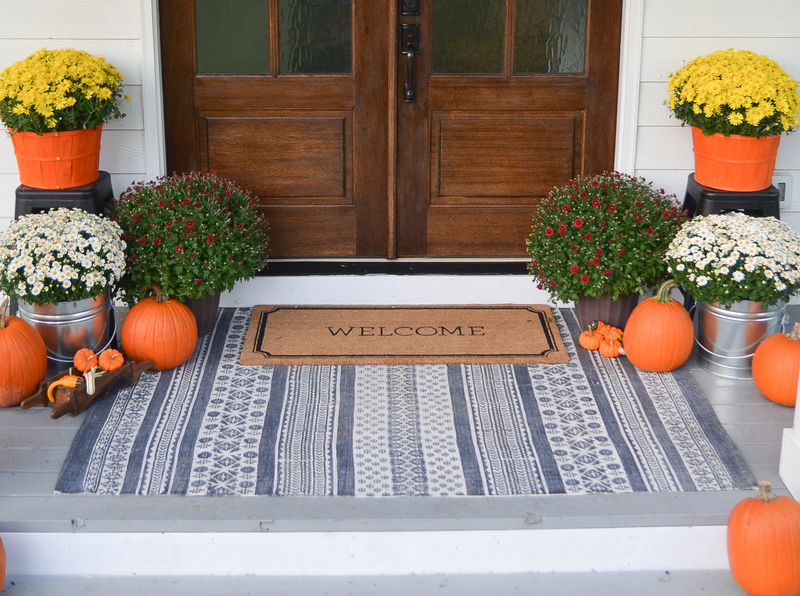 I always try to put a rug under my welcome mat, and it is fun switching it out during each of the seasons. 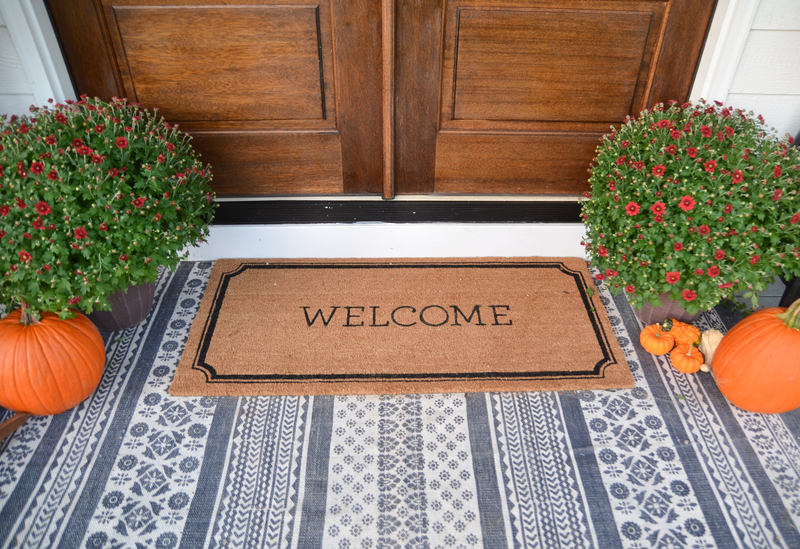 The “welcome” mat is from Target. 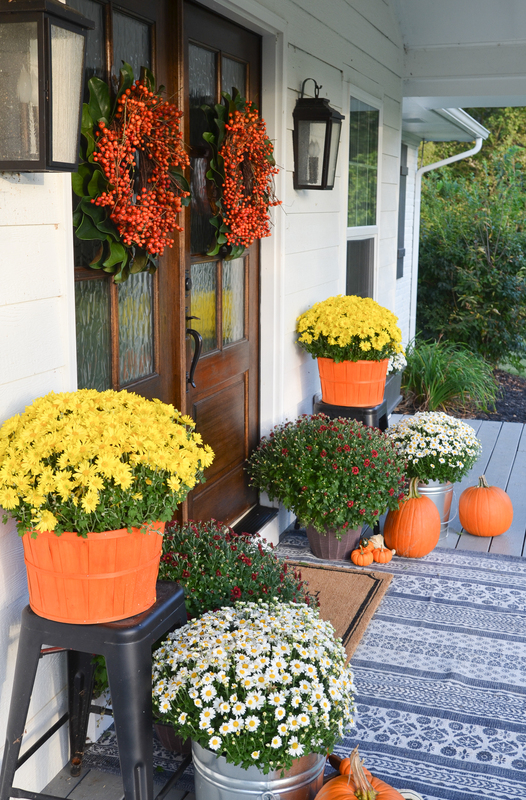 For each side of the door, I put white, yellow, and burgundy mums in different buckets. For some height, I put the yellow mums on some black stools that I have been using as plant stands lately. The stools were a bright red, but I painted them black. I’ve had my bittersweet wreaths for a few years, but they haven’t always had beautiful magnolia leaves behind them. I felt like the bittersweet wreaths needed a little more volume, so I bought these two magnolia wreaths from Hobby Lobby and attached the bittersweet wreaths on top of them. 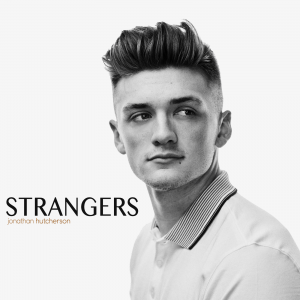 I absolutely love them now! 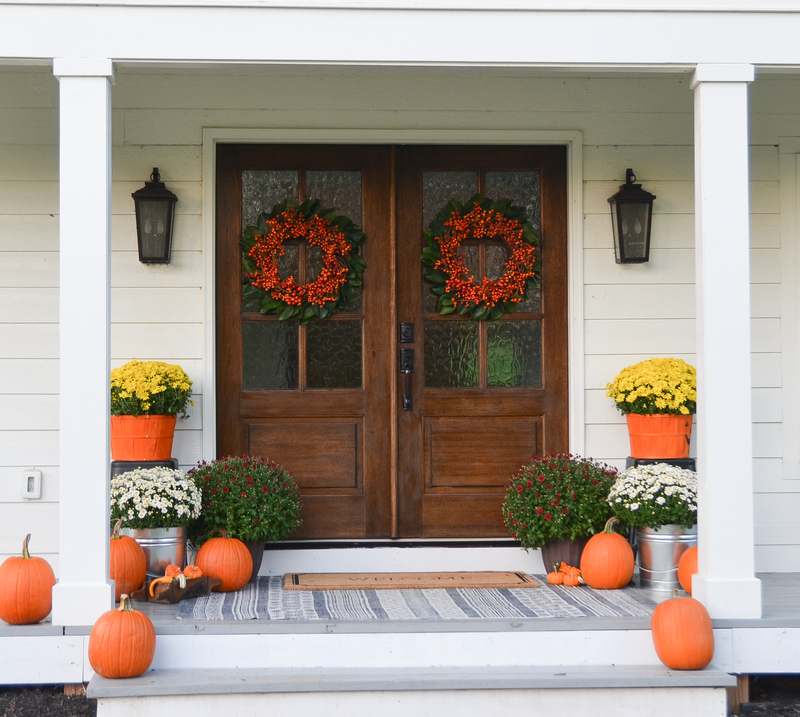 As soon as I placed the pumpkins on the front porch, my youngest kiddos asked me if we could go ahead and carve them for Halloween. :) I had to explain it was a little too early for that right now. Those pumpkins would be a moldy mess by Halloween. Ha! For now, I’ll just enjoy this colorful display each time I walk in our front door. How precious is our God to give us such a feast for our eyes! Well, thank you for stopping by! I hope you are enjoying this fall season in your neck of the woods. You are always welcome here at my ole Kentucky home! Be sure to click on the links below and visit these other amazing bloggers’ homes! *There may be affiliate links in this post. 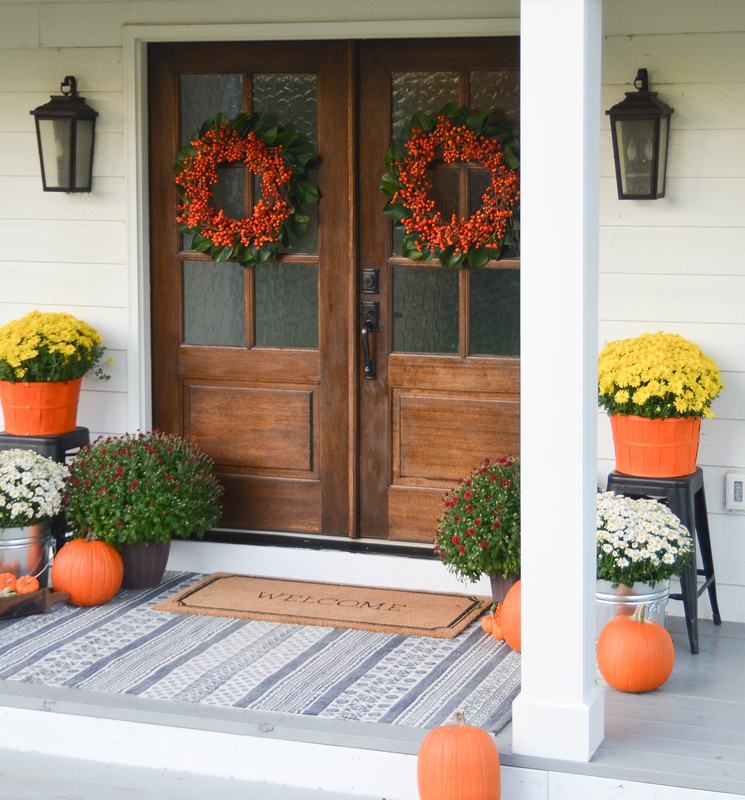 Traci, those doors and wreaths you put together #swoon! Looks great! Love, love all of this! I have just put up the same door. 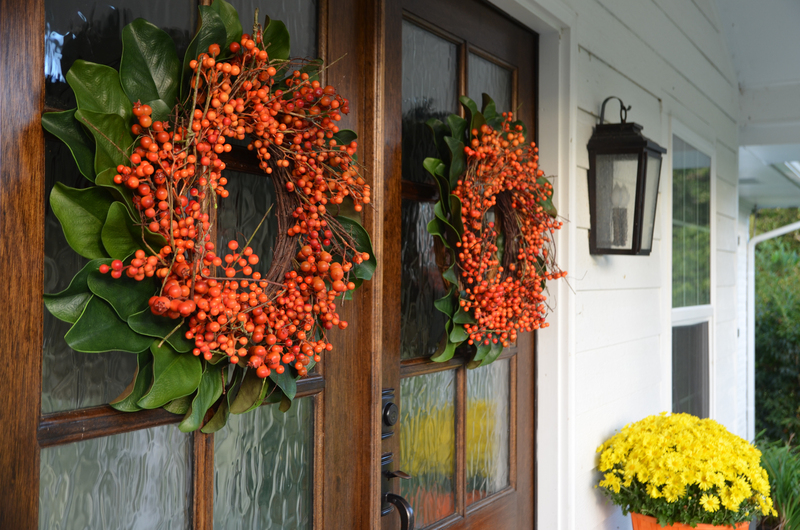 How do you hang your wreaths up? please. me too. manufacturers of the doors! Love the wreaths, bittersweet is one of my favorites. 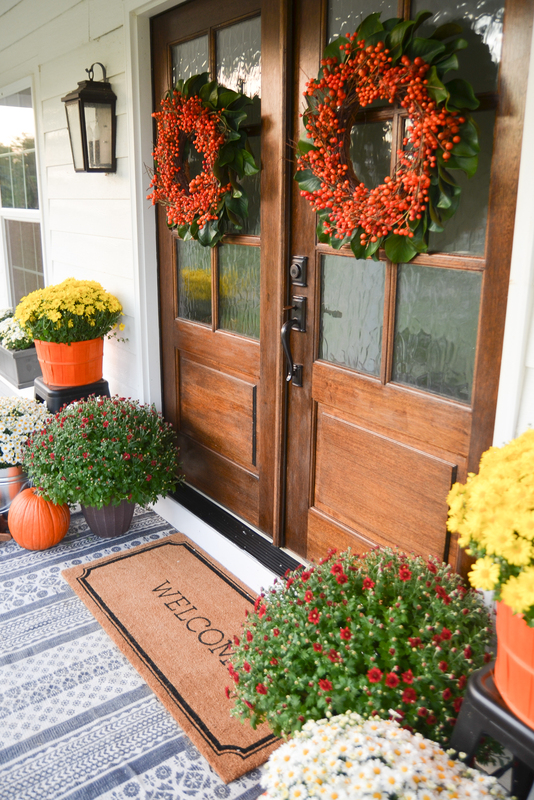 Your porch is welcoming. Enjoy and thanks for sharing. 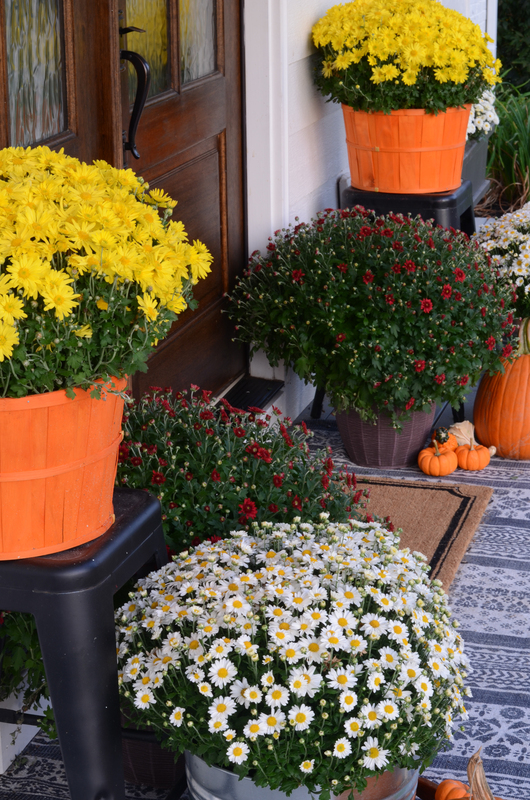 I love the traditional Fall colors too, Traci and your porch looks fantastic! What a creative way to embellish those wreathes! Makes me wish I had some like it, but this year I added to the traditional wreath I already have and it looks just fine. I am looking for some real bittersweet to add to a Fall vignette I did on my dining room table, so far no luck. Gives me an excuse to visit a pumpkin farm! Thanks for sharing your creativity. I sure do enjoy it! 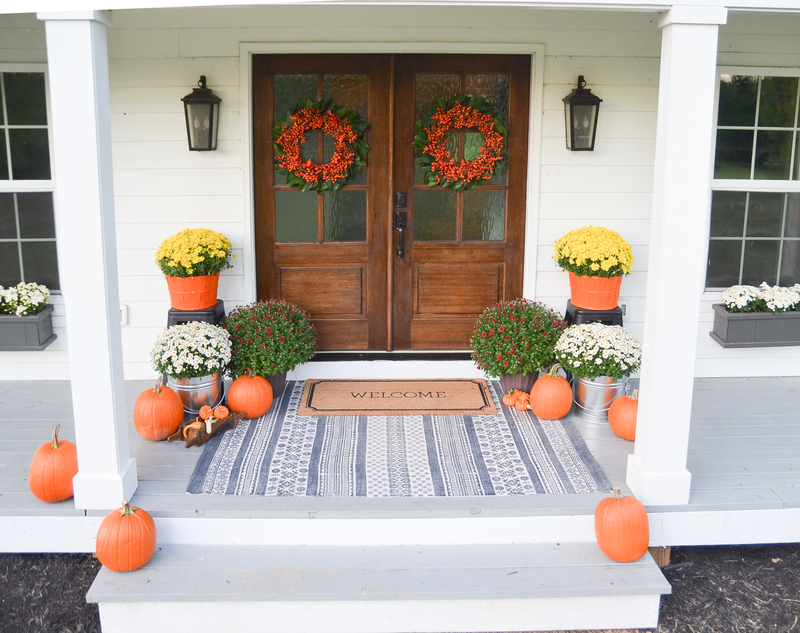 Love the layering you did – both with the rugs and the wreaths! Great ideas and I’m going to be a copycat. Ha! It’s all beauteous. Fall is my favorite season. Seeing your beautiful front porch reminds me why. What a warm welcome.. love everything you did. You really do have a great view from there . 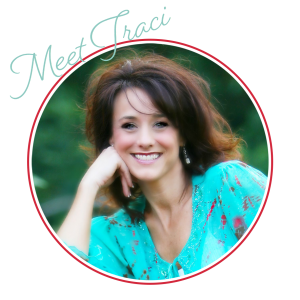 Love your blog Traci. Fall is my favorite too! I’m gonna have to copy your wreath idea. You know how we LOVE volume in Texas!!! Now I can’t wait to decorate the porch this weekend. Happy Fall, y’all!! So classic and beautiful! What an inviting entrance. Those wreaths are gorgeous. They could carry me right through Christmas!